If you know the basics of soup making, you don’t need to follow the recipe word for word, but instead can glean inspiration from recipes and use what you have on hand. With a nice sharp chef knife, a cutting board and a Dutch oven there are endless possibilities. See equipment below. The base of the soup usually starts with sautéing some vegetables, which flavors the oil or fat. Choose a fat that can handle the temperature. Read more about FATS here. then 1-2 carrots, and if I have it, celery, both chopped finely, or medium-fine, about a half inch chunks. Chefs call the classic mixture “mirepoix”, otherwise known as the “holy trinity” in the cooking world. If you want to add more vegetables, you can add them to the mirepoix about 5-10 minutes after the carrots and onions. The key here is that all the vegetables should be a similar size so they cook at the same rate. Think about the denseness of the vegetable and add it into the soup at the step that gives it enough, but not too much, cooking time. Sweet potatoes would be added earlier than kale. In terms of amounts, I like to stick to around 4 cups of vegetables for 4 to 6 servings of soup. Note: you can reserve the most tender veggies and herbs such as for the very end after the broth has been added and the soup has simmered. When everything has had time to soften, start adding the tender aromatics. If you cook these too long before adding the liquid, the aromatic oils you want to collect will be lost, as in cooked off, room freshener. Ginger, fresh, can be added in the last 30 seconds before adding the broth. Peel with paring knife and finely mince ginger – slice as thin as possible against the grain, then chop the thin slices finely in one direction, then turn 90 degrees and mince. Lemongrass, galangal (Thai ginger), anise – you can add these as chunks to simmer with the broth – for flavor – but don’t eat if big chunks. Add some meat – sliced chicken breast or skin-less thigh, beef slices, ground meat, sausage, pork slices, fish chunks. Cook till close to nearly done. If using beef stew meat (chunks of beef), you will want to cook these longer and perhaps even separately first, then set aside and added at this step. While the meat is cooking, you can add spices in above step now instead of with veggies, or some spices with each step. If using ginger, add last, just before you add the broth. 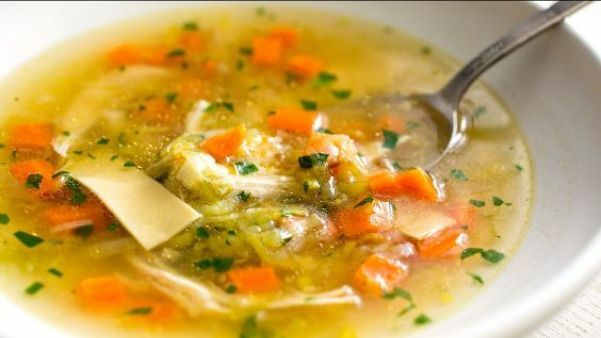 Broth – Add chicken, beef, veggie broth or stock (homemade or store bought) or water. I often do 1 quart of broth and then another quart or so of water. Check out this delicious and healthy recipe for: BONE BROTH. Simmer Times – Okay, this is where the magic happens. How you cook your soup is important. You’ll want to simmer your soup, not boil it. Boiling soup too rapidly can cause the broth to turn cloudy. So how long do you cook it for? It depends. Obviously, you want your meat cooked through and your vegetables tender—which should take 20 to 30 minutes. Grains / Starches – Add starches like potatoes, rice or pasta and time them so when they are done cooking when the soup is ready. Beans, cooked – add in the last 5 minutes or so. If you’re using pasta/grains, add it 10 minutes into cooking. Most pasta will take about 10 minutes to cook. And remember, grains and pasta expand, so you don’t need a lot—about 1/2 to 1 cup of each for 4 to 6 servings should be plenty. Add starches like potatoes, rice or pasta and time them so when they are done cooking, your soup is done cooking as well. Beans pair nicely with chili powder and cumin. Tomato purée or diced tomato? Cream or Coconut milk – add at the end. Don’t boil – when you reheat this soup, just bring gently to temperature. Herbs/Spices – You’re almost done! Taste your soup—make sure you cool down your spoon first! Then adjust the salt and pepper to your taste. Does it need some more spices? What about splash of vinegar or a little sweetness – honey or agave could work here. Add fresh herbs when your flame is turned off the soup, right at the end, before serving. This is also the time to add a drizzle of olive oil or garnish with sour cream or yogurt for some soups. Carrot soup – mirepoix with extra carrots – garlic, fennel, cumin, coriander, ginger pureed with immersion blender – garnished with sour cream and scallion slivers. Chicken curry with carrots, mushrooms, kale and spicy chili. See Slow-cooked Chicken Curry. Chicken with rice – just do the mirepoix, chicken broth, rice and shredded chicken, or this Asian variation Vietnamese Chicken and Rice Soup. Stock mixed with tomato purée is delicious, as is stock with milk. Or even cream with tomato purée! Cream soups might benefit from a dash or parsley or thyme. A large, nonreactive (stainless steel or ceramic) soup pot or Dutch oven that can hold at least six quarts will allow for large batches. Or an Instant Pot or Slow Cooker. An immersion blender or high-speed blender if you are making pureed soup. Immersion blenders keep you from having to transfer hot soup from the pot to a blender. A large spoon to stir the pot. 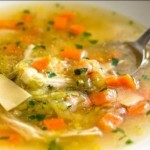 This entry was posted in Healthful Eating, Main courses, Nutritional information, Recipes, Side dishes and tagged soup. Bookmark the permalink. Both comments and trackbacks are currently closed.